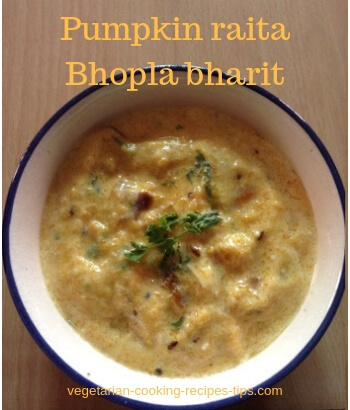 In this Bhopla Kaddu Pumpkin recipes section, you will find info about buying and storing pumpkin, health benefits of pumpkin and a list of pumpkin recipes on this site. Scroll down to go to the list of pumpkin recipes. Pumpkin is known as bhopla(Marathi), Kaddu(Hindi), Kumbalkai (Kannada) in Indian languages. Pumpkin is easily available in India at all time in the year, it is used in many traditional recipes. 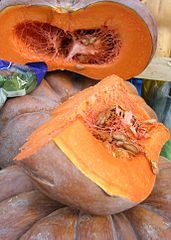 Red pumpkin or lal(means red) bhopla is a good source of carotene. It has a long storage life as it has thick rind - skin. In many homes, pumpkin is stored and used when other vegetables are not available. Pumpkin cooks quite fast so can be cooked and used as a side dish when you are in hurry. Pumpkin is used in sweets such as pumpkin poori (known as gharge). It is also used in side dishes such as subji, bharta , sambar, soups etc. Pumpkin paratha is also easily made. 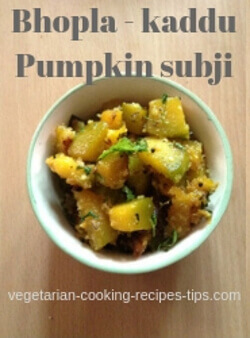 For sambar, subji and bharta, pumpkin is chopped in large pieces/ cubes. For paratha, you may grate pumpkin, thick or thin as you like. Pumpkin is available whole as well as in large or small pieces. A whole pumpkin may weigh a few kilograms so make sure you need that much. You can buy the quantity according to your need. Cut pieces are wrapped in see-through plastic sheets/bags. If buying whole, inspect carefully and make sure that the rind is hard and firm. Softness and moldiness indicates that it may have started to decay inside. Do not buy these. If you are buying pumpkin in cut pieces, see that the color is uniform all over and there is no softness in between. Pumpkin has a hard rind, fleshy inside. It has seeds and fiber. After you remove seeds and fibers, separate the seeds and you can peel them and eat the insides. Very delicious. These peeled seeds are also used in many dishes. Whether you buy a whole pumpkin or a cut piece, make sure you wash it under running water before cutting. You will need a large knife with a long handle if you want to cut a whole pumpkin. After cutting in half, you can take out the fibers and the seeds. I usually use the fibers along with pumpkin flesh. The seeds, I wash and leave on a plate to dry for a few hours or a day and then peel them to eat. The pumpkin flesh is dense and is cut or shredded or grated easily to use in cooking. If you want to store the whole pumpkin, store it away from direct sunlight. Check every few days to make sure that the rind is dry and hard. If you buy a whole pumpkin, you can store the leftover piece in a plastic wrap in the fridge for a few days. But not for too long. Pumpkin is low in calorie. Good for weight watchers. It is rich in potassium. It contains magnesium and iron. Pumpkin is one of the best sources of carotenoids, antioxidants. It reduces the risk of cancer. 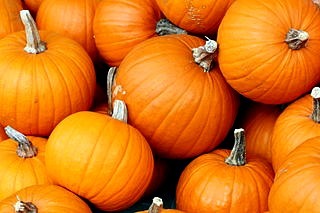 Pumpkin is one of the highest sources of alpha-carotene. It reduces possibility of cataract formation and boosts immunity. It helps in the prevention and treatment of bladder and prostate problems. 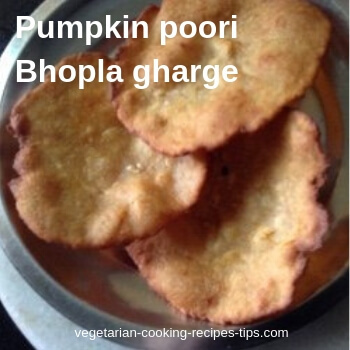 Lal bhopla gharge or pumpkin poori or pumpkin sweet fritters are a recipe from Maharashtra.